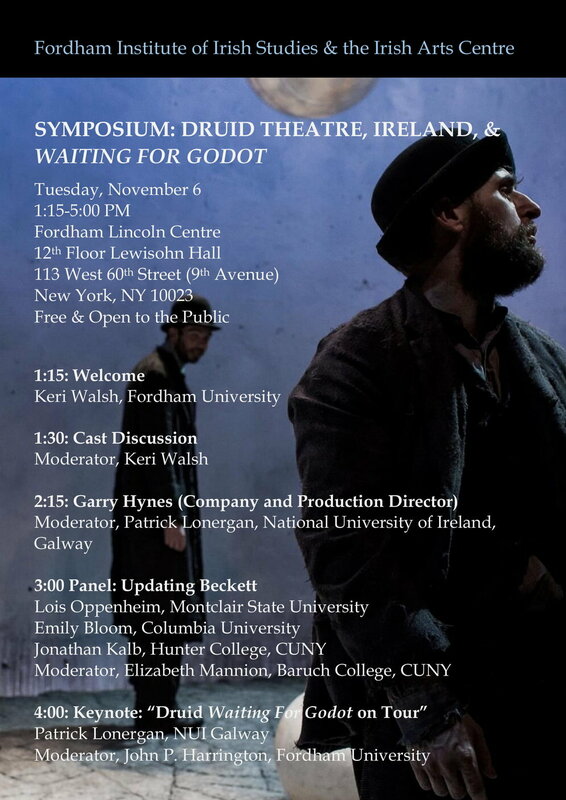 You’re invited to join us for a symposium on one of the great works of world literature, Samuel Beckett’s Waiting for Godot, a work that is as fresh and resonant today as it was when it debuted in Paris in 1953. The Iconic Druid Theater Company is in town to perform Beckett’s irreverent masterpiece, and they’ll be on hand to join in the discussion with several leading Beckett scholars. Details below. “The Dead,” the concluding story in Joyce’s 1914 collection Dubliners, is one of the most beloved and resonant works in Irish literature. It is set in turn-of-the-twentieth-century Dublin, at the end of the Christmas season. In it a couple—Gabriel and Gretta Conroy—arrive at the home of their aunts for an evening of merriment and melancholy. They dine, dance, hear music, and give toasts. All of those assembled---with the exception of one intoxicated guest named Freddy Malins and one full of political passion named Molly Ivors--try their best to suppress their differences in the name of harmony and “Irish hospitality.” At the immersive production, Computer science majors Zainab Shaikh and Chenelle Simpson, and Environmental Science major Lauren Beglin were seated at the head table alongside the actors. They were served a holiday feast inspired by the one in the story, and they were drawn into the events detailed by Joyce. The performance took place at the American Irish Historical Society on the Upper East Side of Manhattan in a townhouse that evoked the period in which the story is set. This year marks the second holiday season in which Dot Dot Productions, in collaboration with The Irish Repertory Theatre and The American Irish Historical Society, will be staging Joyce’s story. "The Dead," 1904 runs from November 18th to January 7th. It is directed by Ciarán O’Reilly and adapted by Paul Muldoon and Jean Hanff Korelitz. Anakana Schofield, author of Martin John and Malarky, will read from her work on Monday, November 21 at 4pm at Fordham's Rose Hill Campus. Schofield is the author of the 2015 Giller Prize shortlisted, acclaimed novel Martin John and the award-winning novel Malarky (2012) Malarky won the 2012 Amazon.ca First Novel Award and the 2013 Debut-Litzer Prize for Fiction in the United States and was a finalist for the Ethel Wilson Fiction Prize. It was named on 16 Best Books of 2012 lists and was selected as a Barnes & Noble Discover Great New Writers Pick. She has written for The Guardian, The Irish Times, The Globe and Mail, The National Post and the London Review of Books blog. Come hear Schofield read from her work at Fordham University's Rose Hill Campus (Walsh Library, O'Hare Special Collections) on MONDAY, NOVEMBER 21 at 4:00 PM. The event is free and open to the public. Sponsored by the Institute of Irish Studies at Fordham University. Bloomsday—June 16th, 1904—is the day on which James Joyce’s Ulysses is set. Among the usual annual commemorations of the date in Dublin, New York, Trieste, Sydney, and beyond, Bloomsday will also be celebrated in Paris, the city where the book first appeared. The American Library in Paris, an institution that was founded two years before Ulysses was published in 1922, will play host to the 2016 festivities. Fordham University's Institute of Irish Studies will welcome Anne Enright to campus on Sunday, April 17. Enright is the author of three short story collections and six novels, including The Gathering, which won her the 2007 Man Booker Prize and the 2008 Irish Novel of the Year award. The event, hosted by novelist Yvonne Cassidy and Fordham Professor Keri Walsh, will commence at 3 p.m. in the Bateman Room of the Law School building (Lincoln Center campus). All are welcome to attend.